Students walk through campus for the annual Walk to Remember. The Thursday event was hosted by Alpha Epsilon Pi in honor of Holocaust Remembrance Day. About 50 students and community members gathered at The Rock on Thursday afternoon to participate in a walk and memorial for Holocaust Remembrance Day. 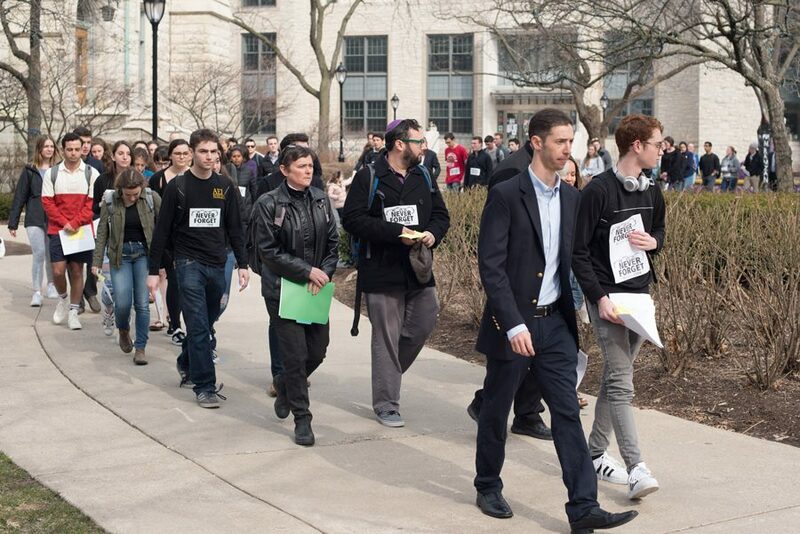 The annual Walk to Remember, which is hosted by Alpha Epsilon Pi chapters around the world, was the final event in a week of programming led by Northwestern Hillel. The week’s events included a Sunday trip to the Illinois Holocaust Museum and a guided discussion Wednesday with a Holocaust survivor, Hillel executive director Michael Simon said. The Walk to Remember began with a silent walk north on Sheridan Road and led back to The Rock for a memorial service. Participants were asked to wear black in commemoration of those who died in the Holocaust. The memorial following the walk featured several speakers, including Sarah Cushman, director of the Holocaust Educational Foundation of Northwestern; Hillel Campus Rabbi Brandon Bernstein; and Tannenbaum Chabad House Rabbi Dov Hillel Klein. Simon completed the service by reading out the names of Holocaust victims and leading participants in a prayer. Speakers stressed the importance of preventing future genocide and organizers handed out stickers with the phrase “never again” on them. Cushman referenced a study published Thursday from the Conference on Jewish Material Claims Against Germany that found that 58 percent of Americans believe something like the Holocaust could happen again. The study also found that 49 percent of millennials, defined in the survey as those between the ages of 18 and 35, could not name a single concentration camp and that 70 percent of all U.S. adults believe that fewer people care about the Holocaust today as much as they used to.